I always thought that the auto ISO on the Nikon D3 is a gimmick but after sorting it out properly, it seems to be invaluable specially when it comes to sports photography. 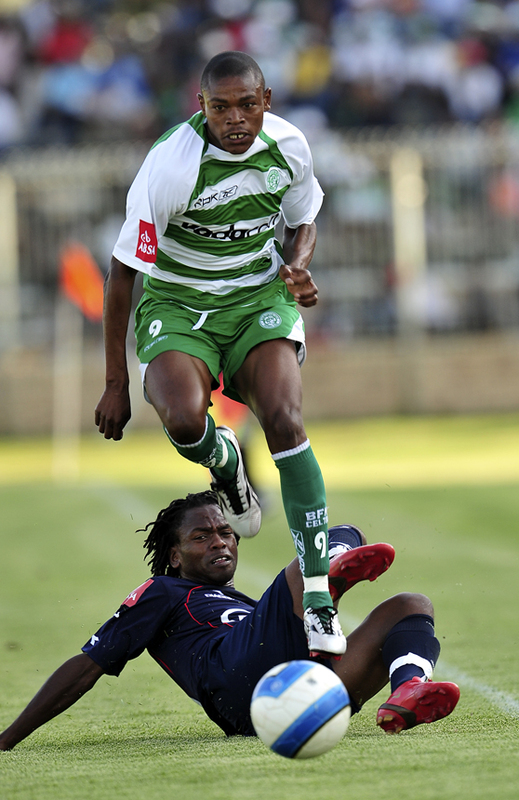 On 26 November Celtic FC played Supersport United in a PSL match and I put the auto ISO to use. I set the D3 on Aperture priority with an aperture on F5 and the ISO on 200. The Auto ISO settings were as follows; Maximum ISO 3200 and the minimum shutter speed on 1/800 sec. What does all this mean? If the light is enough (in the sunlight) my ISO setting will be on 200 with the aperture on F5 and the shutter speed will be 1/800 sec and higher. If the light is not enough(in the shade of the pavilion) the ISO will kick in automatically and will go up higher so that the aperture can stay on F5 and the minimum speed of 1/800sec can still be obtained. Nice hey! In the Photo below of Soul Mmethi the Auto ISO kicked in and went up to ISO 800. The aperture was on F5 and the shutter on 1/800 sec. Heerlik gewees om jou blog raak te “loop”. Geniet hom. Ons moet verseker meer gereeld in kontak bly. Ek hou jou ook op hoogte van verwikkeling aan hierdie kant. Sterkte daar en baie blessings vir die fees-seisoen.